Sometimes you need a change of perspective to see things clearly. We tend to get stuck in the “we’ve always done it this way” philosophy and we close our minds to new, better alternatives. The fact is, the only constant is change and those who can’t adapt are usually weeded out via natural selection. OK, maybe that is a little dramatic given that we are talking about curtain tracks, but the basic idea is still valid. It’s out with the old and in with the new ideas about how to hang curtains; and whenever embarking on a new path in life it is good to look up for guidance; or in this case look up and see…your ceiling. Yep, it’s time to embrace a ceiling mount curtain track in your home. That’s right! They’re not just for hotel windows and retail dressing rooms anymore! Most would-be home curtain hangers approach a project with the same mindset they have always had – I need to put a rod on the wall to hang my curtain. Many do not even realize that there are any other alternatives! The fact that you are reading this blog is proof that you are not one of these curtain-hanging Neanderthals. You know that, in fact, curtain tracks are superior to curtain rods, even in the home. A ceiling mount curtain track has advantages over a wall-mounted track, too. The drapery hardware is less bulky and visible than that used for a wall-mounted track. 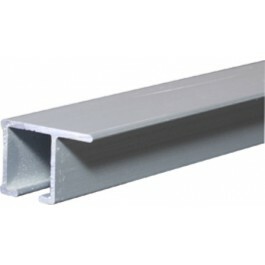 In fact, some of our ceiling-mounted tracks, such as the 32124 Low Profile Ceiling Mount Curtain Track, have no brackets at all and are drilled directly into the ceiling. Some can even be recessed into the ceiling, making them almost invisible, and creating a clean, modern look. We have made installing these tracks even easier by putting everything you need in one place with our ceiling mount curtain track kit! And, did we mention you won’t even have to get out your level? Have you installed a ceiling mount curtain track in your home? We would love to see it! Send photos to info@curtain-tracks.com!